Antimicrobial flooring made up of aluminium oxide, quartz and silicon carbide. Hygienic and easy-to-clean smooth surface. 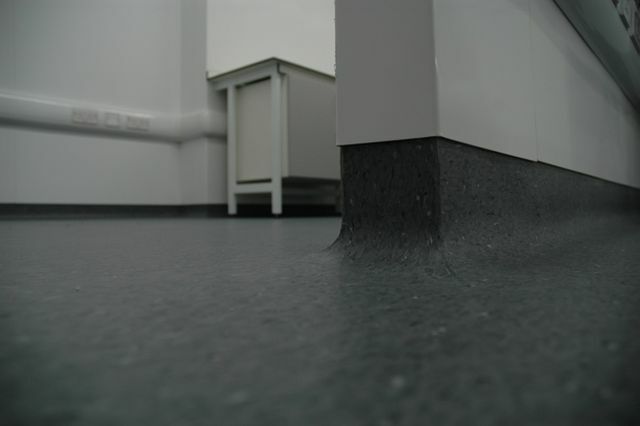 Pressure from footfall creates a slip-resistant surface. Embedded compounds ensure lifetime performance. Flexible; can be flexed into coves, corners and awkward spaces. High PVC content, making it easy to weld. Cellulose backing allows it to bond with water-based adhesives. Contains antimicrobial BioCote® silver ion technology that reduces microbes by 99.9% in two hours. Must be installed using BioFloor® adhesives. Hospital wards and wet rooms. The additives used in BioCote® are registered with the Environmental Protection Agency (EPA), Food & Drug Administration (FDA), Biocidal Products Registration (BPR) and are certified by HACCP International. Antimicrobial (to ISO 22196:2011): Log10 ≥4.83–99.9%. Classification (to EN 649 and EN 685): Commercial: 34; Industrial: 43. Sound insulation (to ISO 140-8): 5 dB. Indentation (to EN 433): ≤0.10 mm. Wear resistance (to EN 660-2): Group T.
Slip resistance AS/NZS (Appendix A – Wet Pendulum, Appendix D – Oil Wet Ramp): P3, R10. Wear layer (to EN 429): 2 mm. Flexibility (to EN 435): 20 mm mandrel (pass). Dimensional stability (to EN 434): <0.4%. Chemical resistance (to EN 423): SRM20 – good resistance to dilute acids, organic solvents and alkalis. Colour fastness (to EN 20105-B02): Method3 >6. Fire performance (to EN 13501-1): Class Bfl-s1.